Released in October 2004, Tony Hawk's Underground 2 (or THUG2 for short) is the sixth game in the Tony Hawk series. 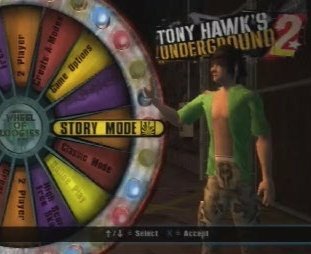 This iteration of Tony Hawk brings players into the World Destruction Tour where it is up to you to create the most mayhem and make the losers pay for the trip. New moves include the Natas Spin, Flips/Rolls, and Focus Mode. Best time: Single-segment 0:07:30 by 'guywithalightsaber' on 2015-09-19. Best European version time on Easy difficulty: Single-segment 0:14:34 by 'mx.lenny94' on 2014-04-14. PC version Single-segment 0:07:30 by 'guywithalightsaber'. European PS2 version Single-segment on Easy difficulty: 0:14:34 by 'mx.lenny94'.